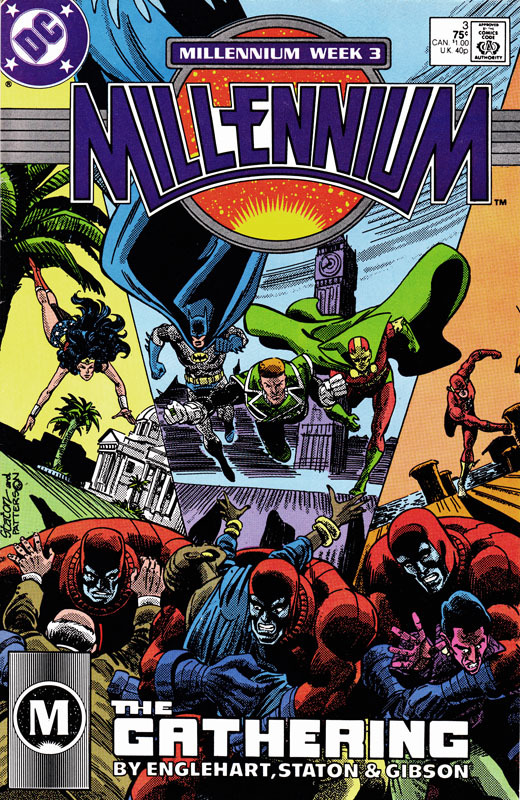 Middle: Batman, Green Lantern Guy Gardner and Mr Miracle at the top, with a Manhunter attacking Celia Windward. Right: Flash at the tip, with a Manhunter attacking Gregorio de la Vega. Page 1: Another gathering of the Manhunters, shouting their favourite slogans. Page 2 – Panel 1: Leading the chants is the Grandmaster. Page 2 – Panel 2: In the crowd are Dirk Davis in the green suit, and Mary Cassidy in the blue suit. Page 2 – Panel 3: The Grandmaster reveals Salima Baranizar, one of the Chosen, has died. This was shown in BLUE BEETLE #20 in Crossovers Week 2. Page 2 – Panel 4: One of the Manhunters questions whether the death of Salima was down to them – a good question as it was an angry mob who killed Salima. 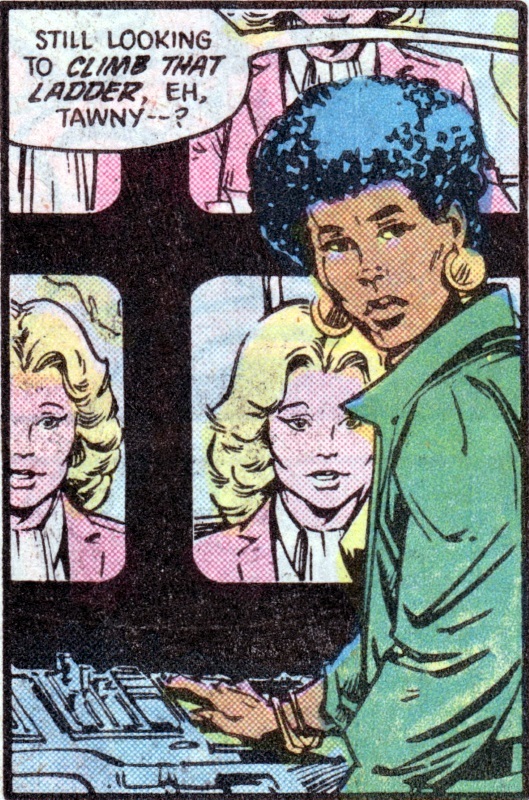 Page 2 – Panel 5: The Grandmaster, however, simply shouts the group’s slogan, claiming responsibility for Salima’s death regardless. Page 3 – Panel 2: In front of Dirk Davies is the unknown blonde woman last seen in MILLENNIUM #1. Page 4 – Panel 1: This is a reporter referred to only as Frost on this page; I have to wonder if she was intended to be Bethany Snow, a reporter who dogged the Teen Titans around this time. Takeo Yakata is one of the Chosen and was visited by Herupa Handu Hu and Nadia Safir in the previous issue. The mentions of Cybil Shepherd and Cliff Robertson serve little except to date this story; although it may be worth mentioning, as a comic related connection, that Robertson later went on to play Uncle Ben in the early 2000s Spider-Man films. Page 4 – Panel 2: That’s Tawny Young in silhouette, a reporter who bothered the Green Lantern Corps around this time, particularly John Stewart. The “Green Lantern marriage” she refers to would be that between Stewart and fellow Lantern Katma Tui. Page 4 – Panel 3: Tawny’s musings are interrupted . . . Page 4 – Panel 4 . . . by her station manager, Mr Niederman. Page 4 – Panels 5 and 6: Niederman is revealed as a Manhunter agent and asks Tawny to block news reports of anything to do with Manhunters. Page 4 – Panel 7: Tawny is happy to play ball as she gets a raise and a guarantee of presenting the Christmas-week news. Page 4 – Panel 8: Note the final, silent panel with the Manhunter agent smiling. Page 5 – Panels 2 to 5: This is Nikolai Latikov, the Russian member of the Chosen who handed himself in to his superiors in the previous issue. Here he’s being tortured by the KGB, all the while telling them what they want to hear. Page 5 – Panel 6: The first two speakers are likely genuine Russian army/KGB officers; their concerns are around the Russian state not having control of Nikolai’s actions if he were to join the Guardians and the other Chosen. Page 5 – Panels 7 and 8: The third speaker simply shoots Nikolai in the head. 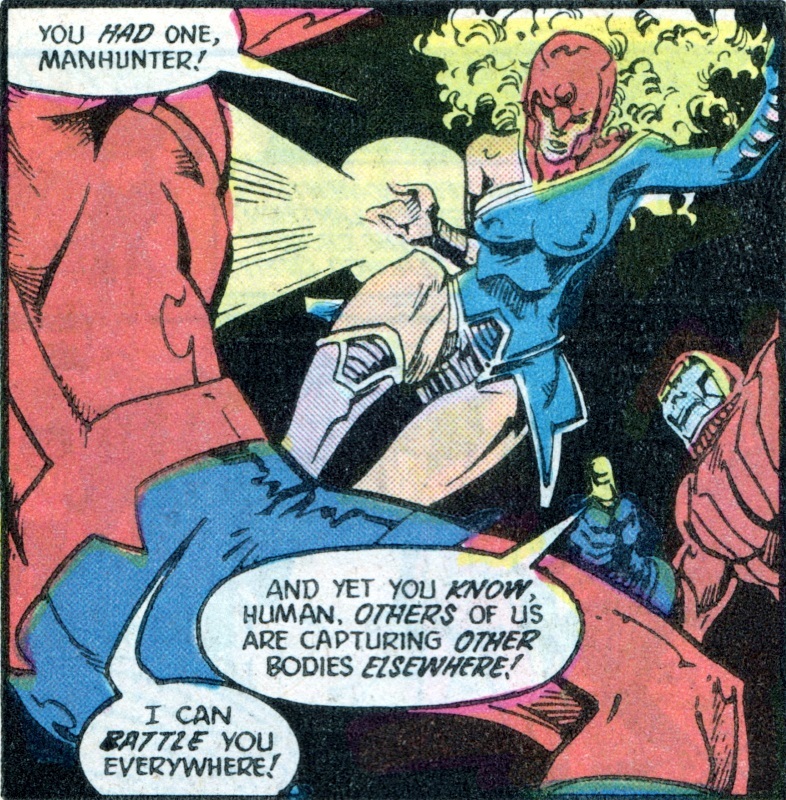 Page 5 – Panel 9: The same silent panel with someone smiling as Page 4, implying this is a Manhunter agent. Page 6 – Panel 1: Left to right in the sky are Green Lanterns Arisia; Hal Jordan; and Katma Tui. In the top right are Herupa Handu Hu and Nadia Safir. In the bubble are the Kalmakus: Keith; Tom; Tegra; and Kari. At the end of the previous issue, Tom was revealed to be one of the Chosen. 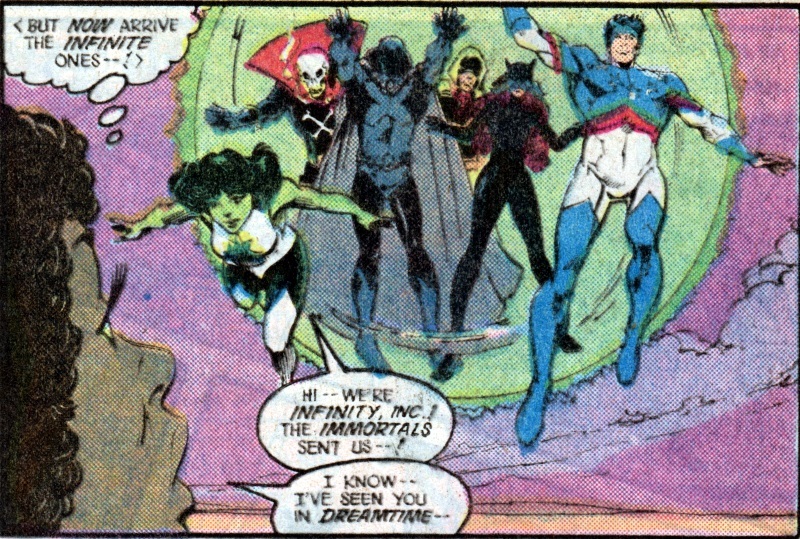 Page 6 – Panel 2: As they arrive at the Green Lantern Citadel, Blue Beetle tells them that Salima won’t be joining them. 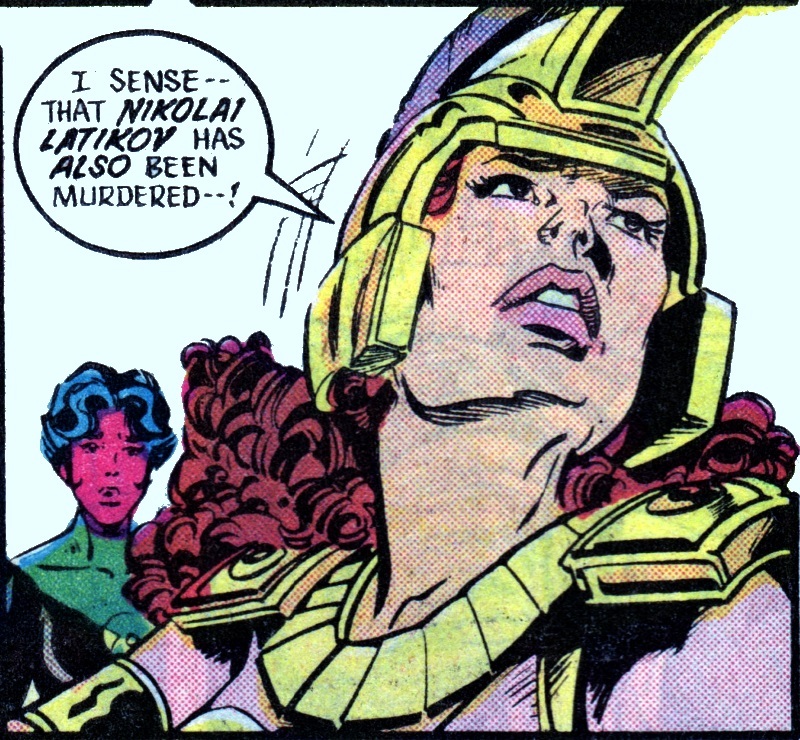 Page 6 – Panel 4: Nadia senses that Nikolai has been killed; strange that there was no mention of her sensing Salima’s death. Page 6 – Panel 5: Tom is understandably worried about being involved with a group of people that appear to be getting killed. Page 6 – Panel 6: “We allowed for attrition!” says Nadia somewhat callously. Page 6 – Panel 7: And Tegra, too, is worried – and who can blame her? Page 7 – Panel 1: Joining the group are John Stewart on the left and Kilowog on the right. On the TV screen is President Ronald Reagan. 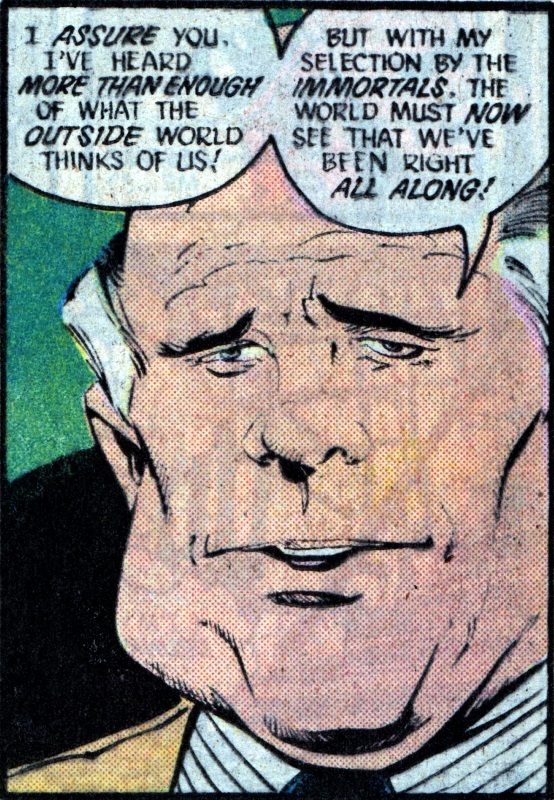 Page 7 – Panel 3: Reagan mentions G. Gordon Godfrey and having been fooled by him about the heroes; this refers to the LEGENDS mini-series. Page 7 – Panel 4: Reagan says he’s asked the heroes at the Citadel to “wind up their business” to calm things down. While Kilowog says that Reagan has indeed asked this – and concludes that he in turn must be with the Manhunters – this is the first that we as readers have heard about it. Page 7 – Panel 6: That’s First Lady Nancy Reagan in the foreground of the page’s final panel, smiling in silence, implying that she, too, is a Manhunter agent. Page 8 – Panel 1: These are the Outsiders, come to take Takeo Yakata to the Green Lantern Citadel. From the top down are Looker; Geo-Force carrying Black Lightning; Halo carrying Katana. Black Lightning mentions Metamorpho’s death and Dr Jace being a Manhunter – this was covered in THE OUTSIDERS #27 in Crossovers Week 1. Page 8 – Panel 3: And here’s Takeo Yakata, ready to go with them. Page 8 – Panel 6: And the Manhunters attack. Page 9 – Panel 2: Looker’s powers are telepathic in nature; with the androids having no brains, her powers are useless. Page 9 – Panel 4: Halo is commanded to save Takeo above everything else. Page 9 – Panel 10: Despite Geo-Force’s words, we don’t see him using any more force against the Manhunters – in fact, he and the Outsiders are fleeing as fast as they can. Page 10 – Panel 1: Betty Clawman, one of the Chosen who’s waiting for . . . Page 10 – Panel 2: . . . Infinity Inc or, as she calls them, “the infinite ones“. Left to right are Jade; Mr Bones; Obsidian; Hourman; Wildcat; and Skyman. Page 10 – Panel 3: The dust storm in the distance is presumably the approach of the Manhunters. Page 10 – Panels 4 and 5: Skyman recommends saving Betty rather than engaging in a fight with the Manhunters, much to the disgust of Wildcat and Jade, the latter of whom can’t imagine losing to the androids. Page 10 – Panel 7: In Washington, the Justice League appear before the public in order to assuage fears. Left to right are Black Canary; Martian Manhunter; Booster Gold; Captain Atom; and Dr Fate. Page 11 – Panel 2: The crowd of haters that the man mentions refers back to LEGENDS when everyone was persuaded that heroes were a bad idea. Page 11 – Panel 3: Booster makes a comment about Captain Atom being quiet . . . Page 11 – Panel 4: . . . which Canary answers but addresses Martian Manhunter. Atom, meanwhile, is concerned about his secret, government led role in spying on the Justice League. Page 11 – Panel 5: Booster has met President Reagan before when Reagan inadvertently gave him his superhero name in BOOSTER GOLD #9. Page 12 – Panel 1: Booster overhears Harry Hadley speaking with another Manhunter agent about Captain Atom. Page 12 – Panel 3: Instead of taking Hadley into custody or to the Green Lanterns for questioning, Booster merely warns him and tells his to leave Atom alone. Not the smartest move. Page 12 – Panel 4: While Booster is convinced there are no Manhunters on his tail, we readers already know that Dirk Davis, his agent/manager, is one of the cult. Page 13 – Panel 1: Booster’s interference seems to be pushing Hadley into confronting Captain Atom in some way. Page 13 – Panel 2: Hadley is as aware of Booster’s Manhunter as we are. In the corner are General Eiling and Amanda Waller. 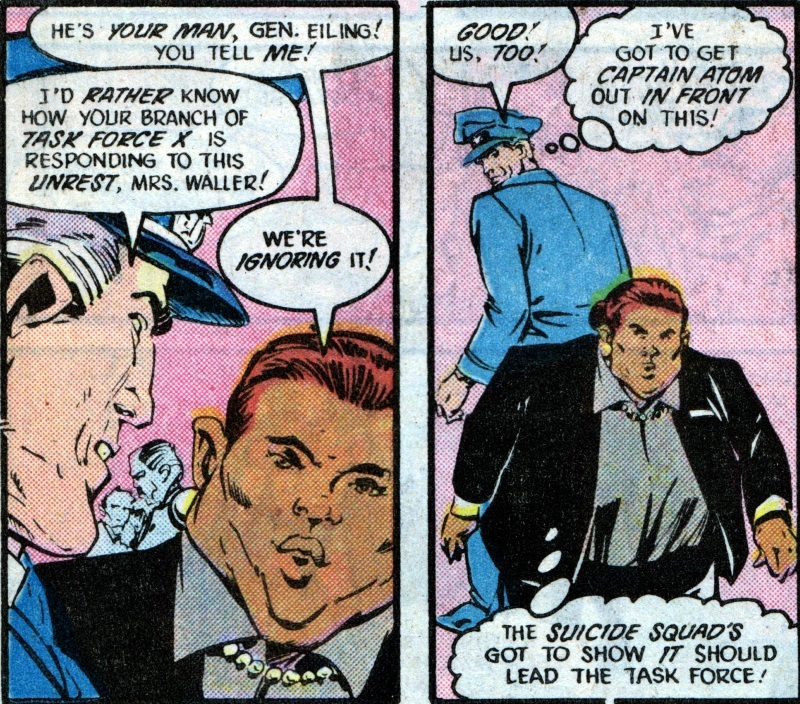 Page 13 – Panel 3: Wiling is in charge of the Captain Atom project; the Task Force X he refers to is more commonly called the Suicide Squad and is under the control of Amanda Waller. Page 13 – Panel 4: While denying any involvement to each other, both are convinced their team/project should deal with the threat. Page 13 – Panel 5: In Arkham Asylum, we meet Dr Wetson. Page 13 – Panel 6: And here’s the Floronic Man whom we last saw at the end of the previous issue, ranting about being one of the Chosen. His comment about “the Bat-Meat trying to get in and see” him refers to the events of BATMAN #415, covered in Crossovers Week 2. Dr Wetson calls him Mr Woodrue as his alter-ego is Jason Woodrue. Page 13 – Panel 7: Unsurprisingly, Dr Wetson turns out to be a Manhunter agent. Page 14 – Panel 1: Although at first, the Floronic Man assumes she with the heroes. Page 14 – Panel 3: Killing the two orderlies puts paid to that idea. Page 14 – Panel 4: And the Floronic Man eagerly joins the Manhunters. You have to wonder at the thought processes of Herupa Handu Hu and Nadia Safir that they would consider the Floronic Man, even as a back-up for Terra. Page 14 – Panel 5: And here we are, back in “Fascist Britain!” where, instead of torrential rain, we have fog up to the knees. 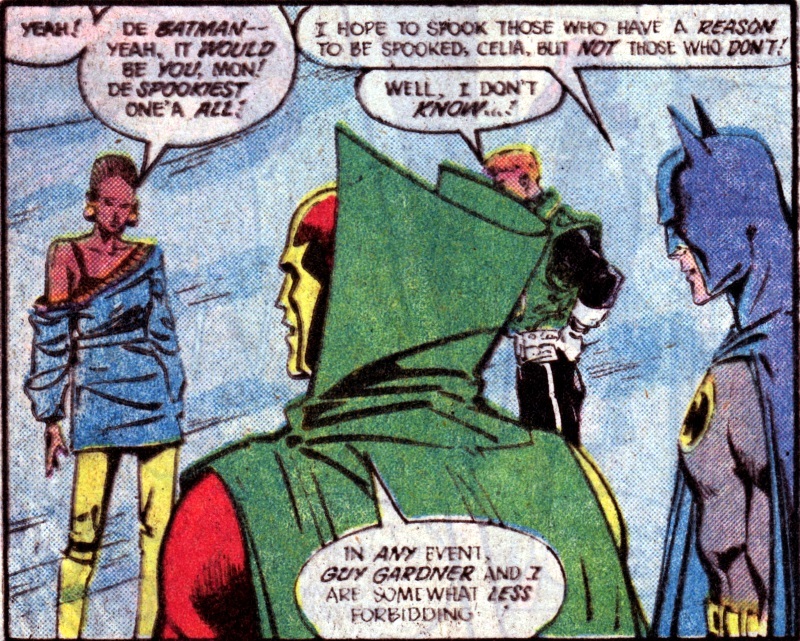 Left to right are Celia Windward, one of the Chosen; Green Lantern Guy Gardner; Batman; and Mr Miracle. Page 14 – Panel 6: Celia clearly isn’t above speaking her mind, calling Batman the “spookiest” of the heroes. Page 14 – Panel 7: Celia says that all superheroes are spooky, unaware that she’s going to end up as one of them. Page 15 – Panel 1: Batman seems eager to cover the cost of her continental phone call, and she reveals that Reagan’s broadcast on Page 7 where he told everyone to pay no attention to the “messiah stuff” made up her mind. Page 15 – Panel 2: Batman is suspicious of the number of people on the street; honestly, I’d be more suspicious of how few people there are. Page 15 – Panel 3: Mr Miracle asks how many there are while lighting up the street with a flash bomb. The answer appears to be four. Page 16 – Panel 3: Under cover of smoke bombs, Guy uses his power ring to fly the two heroes and Celia up and out of harm’s way. Page 16 – Panel 4: Wonder Woman heads to Pretoria in South Africa. She mentions Pan setting her the challenge of helping bring about the Millennium, despite Pan being a Manhunter agent. Page 16 – Panel 5: This is South Africa in 1988 and the apartheid laws are still in force; thankfully, this was towards the end of the regime and in a few years’ time, things would change for the better. Page 17 – Panel 1: And on top of being a racist, Janwillem Kroef is also a sexist. Again, you have to wonder about Herupa Handu Hu and Nadia Safir’s choices. Page 17 – Panel 2: Wonder Woman berates Kroef for his stand on race. Page 17 – Panel 3: But he clearly doesn’t care, rather seeing his involvement as validation of his beliefs. Page 17 – Panel 5: In Peru, Gregorio de la Vega suffers some verbal abuse. Page 18 – Panels 1 to 3: Drunk and in despair, Gregorio decides to throw himself off the pier. Page 18 – Panel 4: Thankfully, he is found and saved by the Flash. Page 18 – Panel 5: Flash has some basic Spanish and is able to speak with Gregorio. Page 18 – Panel 6: Flash mentions his father being bad; this was his father revealing himself as a Manhunter agent in Flash #8, covered in Crossovers Week 1. Page 19 – Panel 1: The Green Lanterns have flown to China. Left to right are Kilowog; John Stewart; and Katma Tui. Page 19 – Panel 2: There they’re greeted by Xiang Po, one of the Chosen. Page 19 – Panels 3 and 4: With the Chinese government giving Xiang Po the opportunity to participate in the Millennium, the difference between the Russian and Chinese communist states is highlighted. Page 19 – Panel 6: Katma Tui spots and shoots a Manhunter agent in the crowd. Page 20 – Panel 3: Now we find Harbinger above the hidden Manhunter world after being manipulated by Herupa Handu Hu to go and look for it in the previous issue. She’s giving herself too hard a time over this, in my opinion. Page 20 – Panel 4: She splits herself into twenty versions of herself and begins to attack the planet. Page 20 – Panel 7: Hardly surprising that her attacks attract the Manhunters. Page 20 – Panel 8: One of her bodies is briefly captured. Page 21 – Panels 1 to 4: One by one, her bodies are worn down, attacked by the Manhunters until they all draw back into the single form of Harbinger who, exhausted, collapses. Page 21 – Panel 5: Until the Grandmaster stands over her, triumphant. Page 22 – Panel 2: The Chosen assemble at the Green Lantern Citadel. We’ve seen everyone here but, just for completeness sake at the back are the heroes: Mr Miracle; Blue Beetle; Batman; Wonder Woman; Jade; Geo-Force; Flash; GL John Stewart; GL Katma Tui; Martian Manhunter; GL Guy Gardner; Black Canary; Skyman; with Dr Fate hovering above the last two. In the foreground are the Chosen: Gregorio de la Vega; Janwillem Kroef; Xiang Po; Betty Clawman; Takeo Yakata; and Celia Windward. Page 22 – Panels 3 to 5: As they’re all gathered for the first time, however, both the Chosen and the heroes begin to doubt the choices of Herupa Handu Hu and Nadia Safir. Page 22 – Panel 6 And then Hal Jordan arrives to proclaim . . .